It is called Kingdom of Pets by Daniel Stevens, I signed up for it just to see if I could learn something...I am appalled and shocked at the bad advice they are giving out. I usually just pass it off to just another uneducated trainer, but this weeks posting about aggressive dog is downright stupid and dangerous..first I want you to read it and then if you know my methods you will see what is wrong with it...after you read it you can see my thoughts on it. The thing about 2-year old Finn was – he had quirks. And by quirks I mean he had a habit of snapping at the hands and feet of strangers. Exercise eh? 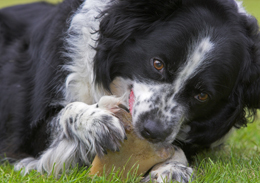 Well – Finn was a happy, healthy, super-fit Border Collie and his two owners were happy, healthy, avid runners – it looked like a perfect match and it should have worked out just fine. The people at the shelter said’ “Give him enough quality exercise and the problem will probably go away.” Except that it didn’t. Finn was starting to display the same behavior in public. It wasn’t that he was clamping down in a proper bite, and he wouldn’t break skin, he would only snap and recoil quickly... but this was still a serious problem that could escalate if not dealt with urgently and appropriately. 1. A Gentle Leader® head harness or a check collar / lead (we suggest you try them in that order if you have not started training with one or the other already). 2. A muzzle. This is necessary in the short term (especially given that one of us was posing as the "stranger" in this case!). With the muzzled dog settled by a "Sit" command, the stranger was introduced to the scene with his hands concealed – one behind him, one in a pocket. When he exposed a hand, and the dog responded as expected, the owner delivered a short sharp correction to the lead along with a harsh "AH!" Timing was everything. When the dog returned to a settled Sit, he was warmly praised. You may have to manually correct your dog’s body position at first, but eventually he will respond to the lead correction and then will only need a verbal command. This could take many repetitions and anywhere between 2-8 weeks to break the habit completely. But it is well worth the effort. In his case Finn got the point fairly quickly and learned good behavior. His owners were firm, as they were instructed to be, and – best of all - no dog trainers lost fingers in the process! "Secrets to Dog Training - STOP Dog Behavior Problems!" So...have you figured out what is wrong. 1) The gentle leader is one of the worst things out there for dogs and was never designed to be used as a correction device. They suggest you use it to correct your dog and they way they suggest using can cause PERMANENT neck and spine injuries. This not only is wrong on a training level but also is dangerous for the safety of your dog. I say this because alot of trainers do not understand basic canine behavior and they are not only not correcting aggressive behavior but they are endagering the lives of dogs and the general public.